We offer a variety of tires to suit your vehicle, driving habits, and budget. There are some people who will tell you that the most important component of your vehicle is the tires. After all, even if everything else works just fine, you aren’t going anywhere if the tires are worn out, damaged, or flat. Add to that the fact that safety rides on the tires, and you can understand why we take tires very seriously here at Lindsay Tire Automotive & Accessories. We understand that everyone has a different budget when it comes to tire replacement, so we strive to have a wide variety of brands available, including discount tires. Our goal is for none of our customers to drive around Clemmons, North Carolina in fear of a blowout or being stranded due to a flat tire. We are happy to inspect your vehicle’s tires and let you know if they are safe and how much tread you have remaining. We also believe you should be able to get the longest life from your tires as possible, so we offer the services that can help you extend the time between purchasing new tires. We can advise you on what your vehicle needs, such as a wheel alignment, tire rotation, rim repair, tire balancing, and tire repair. Whether you have one or two vehicles or a fleet, we’re you best bet for tires and related services. 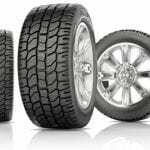 A few of the brands of tires we carry are Michelin, Toyo, Bridgestone, and Firestone. Our technicians are always happy to help you select the right tires based on your vehicle, driving habits and style, budget, and other considerations. They will also go over the best schedule for maintenance tasks for the tires you choose. Our technicians are ASE-certified, which gives you confidence your vehicle is in capable hands. We go the extra mile to make sure you go extra miles! Contact us today to learn more about the tires we carry and the services we offer.